For weeks my office (in our home) has been in disarray. Pictures sitting against the wall waiting to be hung. Files unorganized. Books stuck on the shelves in no particular order. It was hard to get anything done. Today I looked at one of the texts that was sitting on the floor, leaning up against the wall. It reads simply..."The Lord Provides". Does He? Will He? Is a miracle just around the corner? This present (and long-lasting) bout with depression has been a catastrophe in more ways than I care to think about. 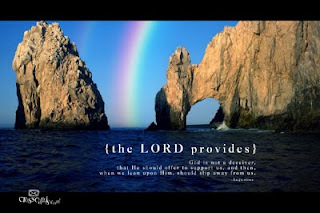 Now, at age 65, I'm out of work and wondering..."will the Lord provide"? I know He does. I know He has. But will He again? Sometimes we overlook the "small" ways that He meets our needs. We are looking for the BIG miracles when smaller ones are all around us. In the past week there have been two HUGE examples of how a sovereign God looks after His own. We needed a van. We had looked "everywhere". Well, not quite, but we had searched for four weeks but to no avail. On Monday we finally found one...right here in Peterborough. The price was much too high. Carol told the salesman what our circumstances were and what we could spend. The van was listed at $10,995. We could only spend about $9,000. taxes included. So what did God do? He gave us the van for that price. The salesman dropped the price by over $3,000. When I left my job I lost all our medical benefits. Both boys have braces on their teeth. How would we pay for the balance owing? Incredibly the plan at my work had covered orthodontics. Very generous! Carol spoke with the staff at the orthodontist's office about our dilemma. The doctor was consulted. His response? 'Don't worry about it. It's been looked after." The amount owing? About $4,500. Does God still supply our needs? Without question. So why do I worry? Why do I fret? The Lord has never failed us yet. But please pray for a job for me. I need meaningful employment. I can't sit around scribbling like a pilgrim all day long. Both uplifting and comforting in every way. It seems God never fails to speak to our hearts like that. In my case it is often when I go to the library and pick up a book to see if I want it. No particular title in mind, just something that catches my eye in the Christian book section, so I pick it up, look at the title, author, and I might read the back and away I go. Later, when I finally have a moment I usually pick up the book and flip it open to just skim thought it and there it is in front of me, the thing I have been wrestling with or an encouraging subtitle that I haven't seen before but it fits to the situation, just perfectly. When I finally get a chance I will sit down and do some serious reflecting and praying. In my case, by the way, it was the words from Ruth Graham's book "Fear Not Tomorrow,God is Already There." The words that caught my eye "Retraining Our Minds to Trust." A reminder from God that He hasn't forgotten that is still an issue for me. His goodness never fails.